The Ford 9N was a two-wheel drive tractor with manual steering and a three-speed sliding gear transmission. With 8×32 rear tires, the highest speed one could reach was 3.9mph in first gear, 5.1mph in second gear, 11.8mph in third gear, and 4.3mph in reverse. Maximum belt power was 23.56 horsepower, maximum drawbar power was 16.31 horsepower, and maximum drawbar pull was 2,236 pounds. The 9N was a smaller tractor, only weighing about 2,140 pounds when dry. When full of the necessary liquids, the 9N weighed approximately 3,375 pounds. The 9N was 9.58 feet long, 5.33 feet wide, and 4.3 feet tall. It had a wheelbase of 5.83 feet, and ground clearance of 13 inches. Despite the size, the 9N made a huge impact on the farming community. It could do just as much work as tractors twice its size, and for a much smaller cost. When the 9N was released in 1939, it was only $585. 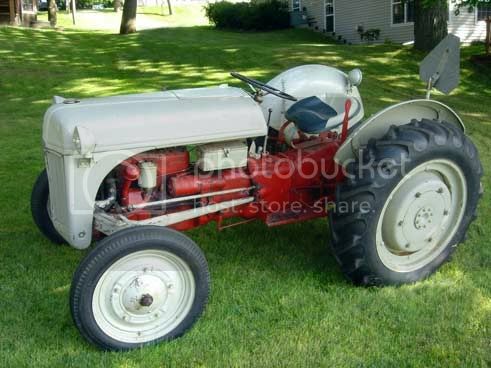 I have two ford tractors one 1940 ford in good shape and my 1953 ford that has been completely restored,I use the 1953 to do all yard work and gardens. I have aquired a ford. Believe it to be a 9n, based on serial number. What has me really guessing is the serial number goes like this. 9n what looks like roman numerial 1 then 8895 again what looks like roman numerial 1. Any thoughts about that. I am not sure I am reading it right. Ford used the capital letter I in place of the number 1. the model will also be stamped on the block just before the serial number. also look for a star or asterisk before and after the model number. the star meant steel sleeves and the asterisk meant cast iron sleeves. The Ford 9N tractor is an exellent all round tractor for smaller farms. I just bought one for ploughing the driveway in winter and harvesting horse hay in the summer. I learned to drive on our 8N, back in the early eightys. I can’t wait to use this “new” 9N, been looking bor one a long time!! I fell in love with my father-in-law’s 1953 Ferguson, so when we moved to the farm, I knew I wanted a classic workhorse. We found a 9n and I am in love with her – Lucy Lou. I have located a serial number – it says “627” and I found the star for the sleeves – the number was stamped on the block just under the star. Am I reading this thing wrong, or am I missing part of the serial number? I have a Fordson 9N that I just got in working order. What is the going price(s) for one of these? I would like to sell it to someone who would appreciate an antique tractor in running condition.